TOKYO, Japan, April 25, 2011 (ENS) – Despite increased injections of cooling water, the water temperature is rising in a spent fuel pool at the damaged Fukushima Daiichi nuclear power plant on Japan’s Pacific coast. The plant’s operator, Tokyo Electric Power Company, says it will inject 210 tons of water into the Number 4 spent fuel pool on Monday, after finding on Sunday night that the temperature in the pool had risen to 81 degrees Celsius. The Number 4 spent fuel pool stores 1,535 nuclear fuel rods, the most at the nuclear complex. TEPCO engineers are trying to balance the amount of water needed to keep the nuclear fuel covered with the structural integrity of the reactor containment building. NHK TV reports that the utility company had been limiting the amount of water being injected into the pool to 70 tons a day, for fear that the weight of the water could weaken the reactor building, which was damaged in last month’s hydrogen explosion. “We will conduct further water spray depending on the conditions of spent fuel pools, if needed,” TEPCO said in a statement Sunday. 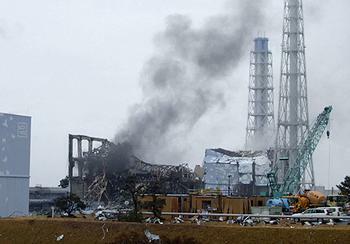 The plant’s cooling functions were lost in the March 11 magnitude 9.0 earthquake and resulting tsunami that cut off outside power to the facility. On Friday, TEPCO found that the temperature in the Number 4 spent fuel pool had reached 91 degrees, so it began injecting two to three times the amount of water as before. TEPCO says the pool’s water temperature dropped to 66 degrees on Saturday after water was injected, but is now rising again. Loss of cooling funtions at the plant have exposed the nuclear fuel, causing partial meltdowns in several of the plant’s six reactors. Hydrogen gas explosions at three reactors in the week following the earthquake blasted open the containment buildings and spread high-level radiation across a wide area. Engineers are not yet in control of the damaged reactors and the company says it could take six to nine months to stabilize them. The accident has been rated a Level 7, the highest level on the United Nations’ incident scale. At least 150,000 people who evacuated the immediate area remain in shelters. The no-entry zone affects households in nine municipalities. The government has decided on the specifics of brief visits by evacuees to their homes within the exclusion zone in a 20 kilometer (12 mile) radius around the Fukushima Daiichi power plant. Evacuees will be allowed to stay no longer than five hours, officials said Monday. Prime Minister Naoto Kan told legislators Monday that more than 26,000 households will be involved in the visits, which will continue into early May. Fukushima prefecture has begun to euthanize some of the farm animals left in the exclusion zone, where there are more than 370 livestock operations with thousands of cattle, pigs and chickens and about 100 horses. The prefecture says it will not kill any animals unless their owners agree. It will conduct the work through the end of May, while discussing with the central government ways to compensate the animals’ owners. The Japanese government is setting up a panel to revise its basic disaster preparedness policy to take into account the lessons learned from the March 11 earthquake and tsunami in future preparedness measures.